Michael A. Burstein. 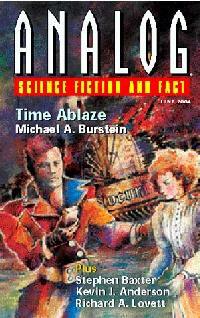 Time Ablaze. Somewhat formulaic time travel story in which a traveller from the future who has come to witness a ferry disaster off the New York coast at the beginning of the 20thC comes to break a cardinal rule in trying to change those events. Obviously there are dangers in such fiddling, and for those readers who are not familiar with such dangers, the character helpfully explains at some length about the issues involved, including something called a ‘Grandfather Paradox’ with which Burstein is able to explain to the reader the complexities of such. The traveller is obviously not suited to his job, as he has been found out through him leaving a book he has brought with him from the future on the table of the room he rents from a family. (duh). Grey Rollins. On the Tip of My Tongue. The story illustration by Wolf Read does a terrible dis-service to SF. The story itself regales us with the further adventures of an inept gumshoe and his alien sidekick who is the brains (and the tongue) of the partnership. Alexis Glynn Latner. Blu 97-023D. A recently-widowed scientist has a conundrum to solve. What can be causing satellites in Earth orbit to be mysteriously disappearing? It transpires that it is some robotic garbage collection vessel, arrived from out of system. Kevin J. Anderson. The Bistro of Alternate Realities. Loren Zarken is ruler of his very own solar system. Ruling is perhaps a misnomer, as he is the only intelligent creature in the system. Woe betide the ship full of colonists who land with a view to settling on the other side of his planet. With self-righteous indignation he terminates them. Prolific and inventive Baxter shows how SF should be done in short format. In his ‘Old Earth’ setting, he postulates a far future Earth in which part of the planet has an intriguing physical setting, with servants who live higher up a mountain ageing faster than those whom they serve lower down the mountain. Baxter crafts a story in which a young man faces up to the future mapped out for him and who tries to find love across a huge gap. I’ll pick out John Allemand’s story illustration for praise. How can the Art Direction team at Analog put in dire illustrations like Read’s earlier one, when they have material of much higher quality to hand? J.T. Sharrah. Greetings from Kudesh. Sharrah suffers somewhat after having his/her story placed after Baxter’s. The author does him/herself no favours in my book however, by using the ‘transcript’ method of avoiding writing a story with a proper narrative. We are given a verbatim transcript of an audio recording made by a Christian missionary who is on an alien world, and who is intrigued to find some startling similarities between her religion and the local one. However, her linguistic skills get her into a predicament, and she is faced with an immolatory demonstration of her faith. The transcript format enables a lot of description of setting and personality and emotion to be avoided, which rather left me feeling that I had read a script rather than a story. Baxter’s story is the only one which felt any different to the standard Analog fayre.